There are very convinient, cost effective powerfull ESP32 boards available available which have WiFi, BLE, RFM95/Lora RF plus LiPo battery/charger availble since more than a year. They are ideal for both: A mySensors Gateway (RF to MQTT) as well as ideal for battery powered mySensore nodes (Nodemanager). I was hoping that I find a comprehesive project - like mysensors to use this boards, but failed because the ideal/convinient ESP32 is not (yet?) supported. So with an ESP8266 I would need in addition a RFM95 and a LipO chnager modul to be soldered which is not convinient and thus I'm looking further for other solutions, although I would love to use this project. I have tried it, but I tought there are too many changes required to adapt for an ESP32 for somebody who does not know enough of the internals of the project. I hope ESP32 support it will make it on the roadmap and other support this request! Have you tried https://github.com/mysensors/MySensors/pull/865 ? If so, could yo provide feedback? As already mentioned, interest in the esp32 has so far been too low to reach a sufficient testing level. I know that most of the github projects are community driven. I think and hope that the community is also interested in the ESP32 boards (successor of the ESP8266) which are cost effective and convinient to use as there are a couple of products available which have LoRa and battery handling on board. So Lora is just a convinient RF On-Board feature (basically a RFM95 or SX1276 board already on the ESP32 PCB) with a more reliable transmission. And it's available since quite a while with a lot of available libraries. The reason why I was not doing all by myself is, that I'm not the exptern in the core and don't know all the dependencies and side effects. I give it a try but got many compiler errors. @mfalkvidd hi, thanks for your reply and as far as I have understood, there have been two enhancements done, ESP32 and RFM95 support! That is all I need (RFM95 is the LoRa chip I mentioned). I'm new to the github test/review process and I'm willing to test this pull request 865, How can I download this build to do some testing? I'm sorry to hear, that people don't show enough interest in ESP32 boards with the RFM95 onboard. I like them very much. @mfalkvidd I think I have found the repository for testing: https://github.com/tekka007/MySensors/tree/ESP32HW. I'll do some testing with my Heltec boards which have an ESP32 + RFM95/SX1276. I'll try a ESP32Gateway and an ESP32 Sensor Node (Temp + Humidity). I'll give feedback. Thanks a lot. @heinzv yup, that’s the one. Looking forward to see the results. If you run into any problems, just post here and we’ll try to help out. I have a few esp32 myself, but have not seen enough benefit when used for MySensors compared to the pro minis and esp8266, especially considering the much higher price point. Same thing with my LoRa radios. @mfalkvidd Today, I have tested the repository from tekka007: https://github.com/tekka007/MySensors/tree/ESP32HW and build a GatewayESP32MQTTClient with a dummy sensor node MockMySensors. For both I used a Heltec ESP32 board with a Lora RFM95 chip. I looks to me as it works perfect. I can connect to my remote MQTT Mosquitto broker and it receives dummy sensor data from the sensor node using 868MHz. See serial monitor log extract. It would be great if this pull request would make it into the master branch in the next upcomming version. Excellent work tekka007! I got ESP32 and the Lora RFM95 / SX1276. @heinzv excellent! Thanks for the feedback. @tekka In your opinion, are there more tests you'd like to see before the esp32 support is merged? Any important features not yet implemented? @mfalkvidd great guys, excellent work! I'll do more testing in the upcomming days with more features and will give you certainly feedback. I'm trying to build some temp/humitity/pressure sensor with e-paper display (I have a couple of 1.54 to 2.9" e-papers) in a small enclosure with a Litium battery. Each sensor with e-paper in each room connected to the MQTT Gateway to an OpenHAB based home automation. This will control some IR heating panels. On my reseach, I found the SHT31 from Sensirion as very accurate temp/humidity (better than others like the DHT22) with an additional Bosch BME280 both are supported by MySensors (very nice). I also have seen that there is a feature to get the system time from the Gateway/Controller so that the e-paper display of the sensor nodes can show the date/time/weekday (the ESP32 has a build in RTC even during deep sleep). Battery sensor support is also there to show the battery state on the e-paper. So I hope I can that working with the build in ADC's. So what might is probaly missing is a standard e-paper support. That would be nice (most brands are compatible, I use the ones from Waveshare) to build sensors with display where the battery last for a year+. Another thing - not sure if it fit's to the MySensors scope would be to control remote smart power plugs with energy monitor (868MHz or WiFi). Would that be possible? THere are nice ones available for 15-20€ WiFi which have an energy monitor built in. Such as Gosund SP1 or Homecube SP1 etc. which use an ESP8266EX (most use the same HW). https://www.amazon.com/Monitoring-Compatible-Asistant-Required-Anywhere/dp/B076VMNNRZ/ref=sr_1_fkmr0_2?s=hi&ie=UTF8&qid=1522098551&sr=1-2-fkmr0&keywords=gosund+sp1 I use the EU plug version from Amazon.de. To your comment what advantage the ESP board has: I have tried to explain: It has the ESP32, the RFM95 and the LiPo switch/Charger all on one board without any soldering required and thus very small for 3 required features, For the Gateway, also the on baord OLED can be used. In total, it's not more expensive than all three parts extra and need less space no soldering etc. So that is all for today. I hope I get some positive feedback and thanks again for the good work. regarding esp8266 vs esp32, I think this is not comparable, esp32 is far more powerful, so it can do more better. I use MySensors with esp32 as gw too, betatesting with tekka for months, still testing and having fun on my side. I understand people like cheap price, but you don't always get what you would expect. aliexpress boards doesn't always rhyme with quality..
Just take a look at their wifi antenna design, and you might laugh, I do! The first link looks ok, the placement of the wifi antenna could be better for a devboard. Finally what to think of these designers..and LORA designs or rf skills. not really fcc stuff for sure! Regarding epaper, new sensors or things like that, it can already be used in MySensors, why not? but I don't think it is up to MySensors to handle this, it's up to the users to make sketch. Types are already available in MySensors I think. @scalz I agree with your statements. I like both the ESP8266/8285 as you get super-tiny and very cheap boards (like the ESP12-F) if you need only WiFi. For many cases, it is sufficient. What I like with the ESP32 boards is that you get battery support + charging and also RFM chips on board. So a single board with all I need for battery powered devices. For Gateways it's also ideal because much more powerfull dual core CPU (if that is really required) and BLE + 868MHz all on a small single board. I'm fine with the Aliexpress boards for home usage. Even the RF design might be not high quality it is more than sufficient within a flat/house even with 10mW. dis a couple of distance testing in my flat. And the RFM95 can be SW configured up to 100mW (I rather use 10 to max 20mW). I also like the e-paper (1.54" with 200x200 resolution for 10€). Works fine and need almost no power. For the Gateway, The onboard OLED for control/diagnostic/config infos is also usable. Looking forward to see more cool stuff. @heinzv that's what I said! I prefer esp32 too I have a some esp8266 that I'll never use because I didn't like it, it was limited imho..
@scalz Mobile comes of course on top, but having wall mounted sensors without any display is not really convinient. And for the gateway OLED could be used just showing the state, IP address etc. not more. @heinzv for smart wifi socket, look at Tasmota or other similar sw for those esp8266 based sockets, maybe they added support for them. on my side, I bet on voice control to retrieve infos, so no need of wall mounted sensor displays. for more detailed infos, mobile etc for example. Simple, like this I can have very discrete sensor without exhibiting them on walls, especially with "unpolished display enclosure", I mean it's easier to make a simple 3d printed discrete enclosure than having to polish it a lot because of the display to have a neat result if wall mounted. One of my goal is the house smart/simple/no maintenance(optimized battery lifetime) enough so i don't need any displays except for data visualization but that's not the purpose of these simple room displays..visualization can be done on TV, smart mirrors etc, only the basic we already use for home, without any addition. @gohan I have some Sonoff Smart Plugs (S20) with Tasmota SW and it works with OpenHAB, but has no energy monitor. They (Sonoff, ITEAD) have currently no EU version with Energy Monitor (only the S31 Plug = US version). The Gosund/Homecube/* SP1 has both and has en ESP8266X and I have dumped the Flash (soldering the RX/TX pins) but I have not found a custom firmware which can be used with the Energy Monitor chip. I have not even found out data for the Chip named (3 lines): HJL-01 J1749 CYH D797480E. I know that one of the experts has connected a logical analyzer to another comerical product and has sniffed/found out the protocol of that chip and write a driver. I was hoping that somebody has the motivation/skill/instruments to also hack one of that attractive plugs. if somebody is interested how the small ESP8266EX smart plug (SP1) looks inside. I don't like the original firmware as it only works with Chinese Clouds. I need LAN and OpenHAB support. I thought ESP32 was too power hungry to run for long off a battery. So, maybe for a gateway, but I suspect that's it. Right? I think this largely answers the OP. @neverdie not really, if you read the data sheets from ESP32 and do some google reseach, you'll find that the ESP32 has a compareable average power consumtion than the ESP8266, between 30-240mA when radio is on and <6uA in deep sleep. THe ESP32 has an ultra low power co-processor (ULP). So perfect for battery usage for sensor nodes. It can just provide more CPU power if you need it. statement from a user: "Look at Esp32 technical reference manual chapter 29.3.9. There are also many references to power consumption in this forum and elsewhere. Try to "investigate" more thoroughly. I'm using esp32 with battery and I can get <6 uA consumption in deep sleep mode." but as usual, power consumption is not about numbers only.. it depends on a lot of factors (sdk, hw design etc). I'm also a esp32 forum reader, etc. and don't get me wrong, esp32 is nice as it's my favorite for a gw. I already designed a few boards for esp32, some very old with lora when esp32 was just released.., and I like a lot looking at hw designs. And what I can tell, is the boards you linked will never reach the uA range, they may stay in mA range! Have you measured power consumption of yours? the ulp functions are not integrated in arduino yet. yes, more than a year that esp32 is there, but I think they are very busy with esp-idf. there a few posts about ULP in the arduino section, soon or later, this should be available. the esp32 user you mentioned on the esp32 forum, is well known, agreed, and I don't think he reached 6uA with the boards you linked. I think he got this with custom board or standalone mcu. Not sure, if he used arduino too, maybe esp-idf only. Sure it's possible to import arduino as a component in esp-idf, I don't think most of people go this way..
the boards you linked will also never reach these low power consumption because of their circuit design, they are not optimized! And if you take a look at TTN forums, you'll see same feedbacks..
That's the same for lolin boards..
Like I said, if you're searching for uA range, a board looking cheap doesn't make it a good deal.. I feel this more a battle about who sells more than who sells good quality, and they have cheaper fab cost, sourcing cost, tax, free shipping etc so that's easier. And then buyers see great price and buy, and stores sell, sell volume, because unfortunately not all buyers have insightful eyes! Good for stores, the cheap price trick will always work, sort of societal problem! I noticed also same kind of problems on some tindie stores, so that's not ali only. Maybe good for devboard (and that's depends on the feature you want to test), but then in production it's another story. And for example, I wouldn't like to have neighboors with bad rf designs polluting my frequencies (hopefully I live in country side). I'm sure you'll find some good use for your boards, unfortunately not with a great battery lifetime. Here, I'm always after n years of operation than 6months-a year, I prefer less maintenance on nodes. I agree, if you want a low sleeping current device, you have to go the barebone way: what is not on a board it doesn't draw any current. All that said, I like LoRa a lot. Practically speaking, in a home environment the packets get to their destination virtually every time on the first try. That's big! I just don't see the "need" on a battery operated LoRa for an ESP32, that's all. But maybe that's just me, as I'm doing fairly simple stuff. Perhaps for the OP, the mere existence of off-the-shelf integrated boards makes them more convenient to acquire and use. At least I could imagine that being true for some people. That may be a not insubstantial market segment. maybe he just needs some extra computing power. Isn't LoRa transmission time slower than regular radio modules? Isn't LoRa transmission time slower than regular radio modules? Definitely yes. It's not without downsides. @neverdie I have not yet measured the power consumption in deep sleep, but I will certainly verify it (I have ordered a multimeter with a 0-60uA rage). I 'll let you know. The battery powered wall mounted devices with e-paper is something I'll build. If the ESP32 Lora board is not what I expect, I need, what other choises do I have? Buying a nrf52 board (some have a battery management) with a RFM95? Do you think that is the better choice? The nrf52 board are not cheap. What combination would you recommend? I also have STM32F1 with 128kb flash, but the look also not so convient to me. I have gone through many articles and watched many videos and did not get the impression, that the ESP32 is wrong for efficient battery usage. Here is one video with an ESP32 board a guy measured with a Fluke 5.x uA in RTC timer deep sleep and 6.5uA in GPIO deep sleep. So in principal the ESP32 is the right choice but I believe you, that some the boards I have chosen are not the most energy efficient ones without tweaking. I have a couple of other ESP32 boards, maby I have to combine them with my RFM95 modules I also own to get down in the uA range. That's exactly what I meant, I was just talking about the other boards. @heinzv You haven't really said what your requirements are. I'd say give it a try. It's not an expensive experiment. Then you'll know for sure. For all I know, maybe it's just what you're looking for. If not, there's always more and bigger batteries to make it last longer. @neverdie Thanks for the good hints. I also have a couple of 3.3v/8Mhz Arduino or a comparable ATmega32u4 pro mini boards, but not found the Lora RA-01 modules with 868MHz / SX1276 only the SX1278 with 433MHz, in Europe 868MHz is the better choice and my ESP32 have SX1276 with 868MHz. However I have 10 RFM95 modules with 868MHz I could use but I need to connect then two devices at the SPI bus, the RFM95 and the E-Paper. In addition, I also have 3,7 LiPo with 2200mAh batteries but they have 4,2V charged, so I would need a voltage regulator + charger or othe other batteries below 3,6V charged. 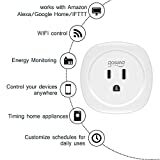 BTW: as you're also a HW expert, I have purchased a couple of the SP1 smart sockets from Gosund, Homecube and Coosa, they all have the same HW with an ESP8266EX and 1MB flash. They all need the Smart Life App and use a Chionese Cloud. I want to flash them with either Mysensors, Tasmota, ESPEasy or whatever, but then I loose the energy monitor. They have a chip which I don't find thus what driver/code should be used? I have posted a support request already in two projects (here and at Tasmota) not sure if anybody is smart enough to find a solution. Above I have posted two pictures of the inside of the Plug. Any idea what we can do? @heinzv Sorry, but I don't understand your question. Also, generally speaking, multimeters alone are the wrong tool for measuring microamp currents. As Scalz already mentioned, something like a uCurrent Gold would be a better choice. Buying a nrf52 board (some have a battery management) with a RFM95? Do you think that is the better choice? The nrf52 board are not cheap. Not sure if you noticed, but nrf5x comes with a nrf24-compatible radio on the same chip. So it is similar to the esp32+lora board you linked to. thanks for all your hints. I'll first continue with my ESP32 Lora board and see how far I come. I also have so many other boards like ESP8266, 8285, 328, 32u4, STM32L1 and a lot of RF modules (RFM69, 95 and CC1101) which I'm testing in parallel. Since I have now an intermediate repository with ESP32 + RFM95 support from tekka007, I continue first on that path and let you know if it fits or not and what results I have. I hope though, that the tekka007 version makes it in the master branch (maybe in the 3.0 version). @mfalkvidd No, testing looks good and framework runs stable - I need to sort out some warnings I get with gitler/jenkins before merging. He has also posted a lot of other excellent ESP32 and LoRa videos. i highly recommend to check them out! @gohan at least my saying is confirmed, that the ESP32 is well suited for battery usage (has the ULP co-processor) and the ESP8266 is not better, rather worse. And you get many ESP32 boards with battery management. Of course, what all the analysis show is that if board design is bad, the battery consumption can be bad. But that would be the same for ESP8266. A relevant question that you won't want to gloss over is how long does it take the ESP32 to re-acquire access to the WiFi router after it wakes from deep sleep? Potentially, a lot of power could vanish into that. More than anything, I think that may be why it so far hasn't proven as popular for battery operation. @neverdie Since the ESP32 (with the right board setup) and LoRA are both optimized for low power and battery saving and a sensor node would only wake-up max. every 60 secs and just reports temp, humidity, pressure and battery level, it shuld be fine. That is only a small message and LoRA optimized for longer range and low power. ESP8266 and RFM69 is supported and not better (I guess even worse). The important thing ist that the sensor nodes do not send date via WiFI AP, that consumes time to connect and thus energy. I don't use ESP32 WiFi on sensor nodes just the ULP deep sleep the RFM96 (could also use RFM69 non LoRa) but then I need to solder a lot. I have now tried to build an indoor sensor with Homematic protocol and an e-paper display using Pa-Pa's AsksinPP and GxEPD libs. Now I'm far beyond the Atmegas328p Flash and RAM and close to the limit of an STM32 maple. So I will go for the little ESP32 barebone boards and a RFM69 (LoRa or ESPNow). I'm very happy, that ESP32 and RFM95 are now supported thanks to tekka! @gohan I will use this barebone ESP32S module without LED, USW, Voltage Regulator etc.